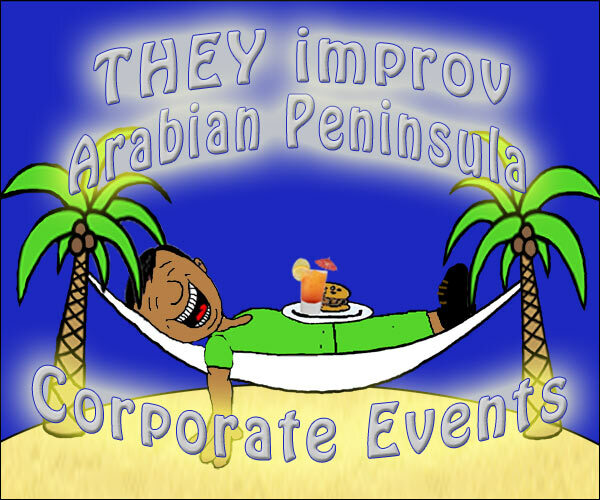 THEY improv provides corporate meetings and incentives awards events throughout the Arabian Peninsula with improv comedy, game shows and murder mystery dinners for entertainment options for a variety of groups and gatherings. Company-friendly entertainment for Arabian Peninsula corporate events, banquets and private parties is our specialty. With a variety of shows to fit almost every need, THEY improv is prepared to help you with your corporate or family gathering anywhere in the Arabian Peninsula. This includes working with the hotels and resorts or you staff to ensure a great time for your guests in Saudi Arabia, Bahrain, Kuwait, Oman, Qatar or the United Arab Emirates. Let THEY improv provide you with ideas and a quote for a tailor-made show to make your Arabian Peninsula corporate event, banquet or private party a success. THEY have entertained many Fortune 500 companies at their offsites, why not let them provide you with an evening of entertainment that will not soon be forgotten anywhere in the Arabian Peninsula? We understand that entertainment in the region has many considerations that must be made. Not the least of which are the cultural differences. If you are looking to entertain a group that both has American, other international guests as well as local dignitaries, there are many potential problems and pitfalls. Most American entertainment companies don't have the capacity to shift gears and to adjust to the people in attendance. Improv, by its nature, adjusts constantly. All of our programs can do so. With a variety of improv comedy, game shows and murder mystery dinners, THEY improv can put something together for almost any occasion. We can custom tailor any of these shows to your group and circumstance based on audience reaction. This ability to react and adjust in the best guarantee of quality in the case of a multi-cultural audience. Once you contact our director we'll discuss your needs and work with you to develop a program that will meet your needs within your budget. This includes getting an understanding of how many people will be in attendance, what their background is, when this will be, what the goals are for the evening and any language issues. 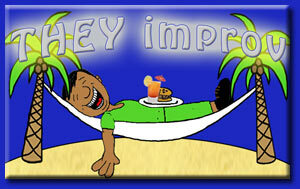 THEY improv can provide these in hotels, resorts and on cruise ships in Saudi Arabia, Bahrain, Kuwait, Oman, Qatar, United Arab Emirates (UAE), Yemen, and practically everywhere else in the Arabian Peninsula as well. Some circumstances may require travel or legal documentation that may add to the fee. Simply ask us as we develop a proposal for your corporate event.